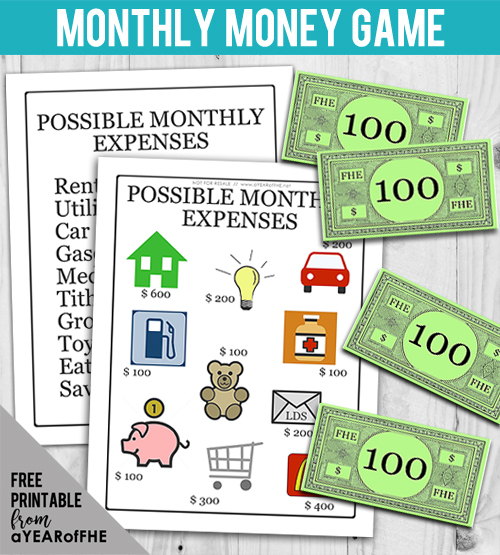 What You'll Need: LDS hymnal, printed copy of the Monthly Money Game. Heavenly Father has blessed us with everything we have. Our home, our family and all of our blessings. To live as a family we have to make and use money. 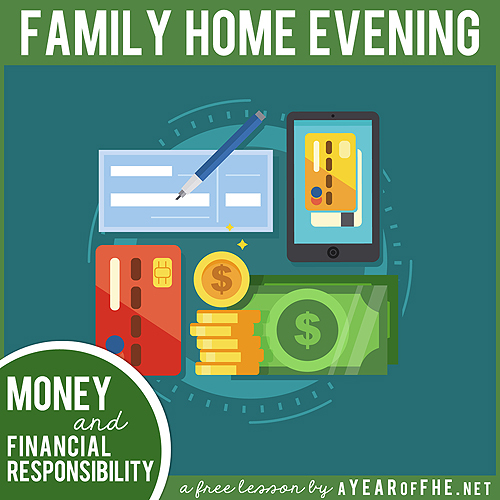 Heavenly Father has told us to use our money wisely so our family can be happy, healthy and prepared for emergencies. The Prophets council us to get a good education so we can earn a living. We must work hard and do our best at all times in order to provide for our families. They have counseled us to use our money wisely. Here are some of their suggestions. - Pay an honest tithing. We have been commanded to pay 10% of our income to the church and to also pay Fast Offerings. When we pay these things we will be blessed. - Live on less than you earn. We should try to keep our expenses (amount of money we spend each month) to less than the amount of money we make. 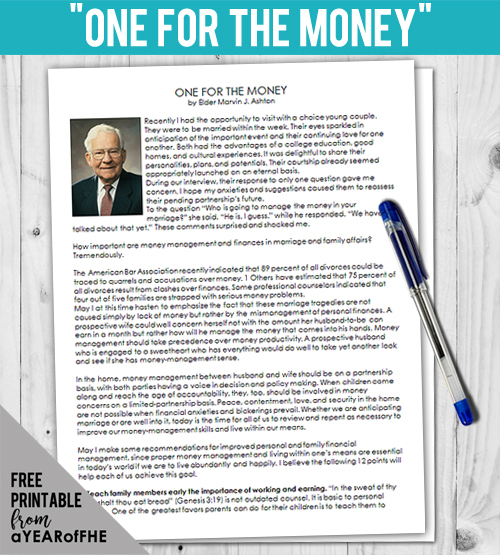 President N. Eldon Tanner said, "I am convinced that it is not the amount of money an individual earns that brings peace of mind as much as it is having control of his money." - Learn to distinguish between needs and wants. Sometimes we really want something because it would be fun to have, but that doesn't mean that we need that thing. We should spend money on things we need before spending money on things we want. Bear your testimony about the hard work, energy and blessings that provide your family income and the responsibility we have to use our money wisely.You may choose to include your testimony of paying an honest tithe, even when it is hard or share a time when your savings helped you in an emergency. Great lesson for adults and children. We're doing this lesson tonight, I can't wait to see how the boys do. I know they're going to spend all their money on McDonald's and toys. We did this tonight and my 5 year old loved it! The game was perfect. Thanks! Thank you for sharing your talents and knowledge. It is obvious you care about teaching what is important. I especially appreciate that you use quotes directly from our church leaders. Thank you! Thank you! Thank you for the fun lesson about learning the importance of spending wisely. I am planning on using it for an Activity Days lesson. Griffin's Church Loans takes it always as their responsibility to leave better off the churches with that it has worked. They provide church loan and creative financial plan to the churches for its betterment. Where is the link to the game? It just pulls up a jpg for me? How nice post is! If you are aged 55 or over then you are eligible to take a release of equity any use your wish. So go to https://www.londonequityrelease.net and learn about your needs.